The United States is "not aligned" with any political party or group in Egypt following the ouster of Islamist leader Mohamed Morsi, President Barack Obama said Saturday. Obama, who spoke with members of his National Security Council via conference call about the situation in Egypt, "condemned the ongoing violence across Egypt and expressed concern over the continued political polarization," according to a White House statement. He "reiterated that the United States is not aligned with, and does not support, any particular Egyptian political party or group," according to the statement. "The United States categorically rejects the false claims propagated by some in Egypt that we are working with specific political parties or movements to dictate how Egypt's transition should proceed," it said. "We remain committed to the Egyptian people and their aspirations for democracy, economy opportunity, and dignity. But the future path of Egypt can only be determined by the Egyptian people." Egypt's presidency said Saturday that liberal leader Mohamed ElBaradei has not been officially appointed prime minister, after several official sources said the former UN nuclear watchdog chief had been named premier. "Interim president Adly Mansour met today with Dr. ElBaradei, but so far there has been no official appointment," presidential advisor Ahmed al-Muslimani told reporters. He added, however, that ElBaradei was "the logical choice" among a list of names being considered in the wake the military's ouster of Morsi. ElBaradei, now 71, won the Nobel Peace Prize in 2005 for his work as the head of the International Atomic Energy Agency. He returned to Egypt in 2010 and became a prominent opponent of veteran strongman Hosni Mubarak in the lead-up to the 2011 uprising that overthrew him. His appointment came as an Islamist protest to demand the reinstatement of Morsi petered out at nightfall, following 24 hours of ferocious violence that killed 37 people and injured more than 1,400. The White House called on Egyptians to "come together in an inclusive process that allows for the participation of all groups and political parties." "We urge all Egyptian leaders to condemn the use of force and to prevent further violence among their supporters, just as we urge all those demonstrating to do so peacefully," it said. "Over the days since the unrest in Egypt intensified, Secretary (of State John) Kerry has been in constant contact with the national security team, regional partners, and his counterparts," the department said in another statement. US media had reported that Kerry had been relaxing on his yacht in the upscale resort of Nantucket, Massachusetts, as the crisis in Egypt deepened. The Pentagon also said US military contacts were frequent and fluid. "Yesterday and today, Secretary Hagel spoke to Egyptian Defense Minister al-Sisi on three occasions to discuss on-going events in Egypt," Pentagon spokesman George Little said. "Hagel emphasized the need for a peaceful civilian transition in Egypt. He also noted the importance of security for the Egyptian people, Egypt's neighbors, and the region," Little added. 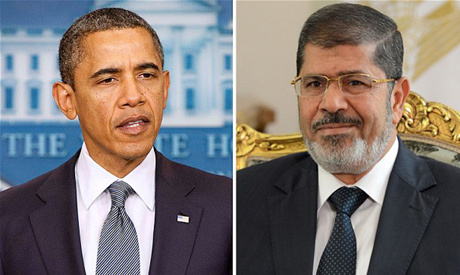 President Obama has always said he supports what the people of Egypt want. Now does anyone wonder why he is having a difficult time attempting to find out what that is? Within one hour Egypt has a new PM and then Not. Confused? I wish Egyptians would read their own press reports since the 25 January revolution. Egyptians seem to be all warm and fuzzy that Saudi Arabia has smiled on 30 June. But now we find that the Salafi Nour party is blocking El-Baradei's Prime Minister appointment. Remember the Saudi's hate The Brothers and support the Salafi who believe The Brothers are too liberal. Sometimes warn and fuzzy words are just words and smiles are those of sharks ready to eat. Sometimes words of concern are just that the words of concerned friends wishing Egypt's new democracy all the best. I have seen demonstrators in Egypt wave Saudi flags, non with them waving American flags or the flags of any other democratic country. Sam, this will be a short lived smile on US and its puppets military, and traitors faces and it will over soon. Real elected president will prevail. Washington will be eating dust.